Il Vecchio Mulino, The Old Mill, is situated among the rolling curvaceous hills of the sienese countryside , on the border of the provinces of Siena Florence Pisa and Grossetto in the picturesque medieval towns of Radicondoli and Belforte . As the name suggests the building was a mill in past , today it has been restructured and extended, maintaing of course all of it’s original architectural features and charm. The edifice is surrounded by beautiful gardens leading to a lovely swimming-pool where you can relax among the olive trees. For those who love eating outdoors in company there’s a gazebo with barbecue bbq, all ready to enjoy the local produce; wines, typical Tuscan fare and many delicacies - these days more and more difficult to find. Il Vecchio Mulino is comprised of five apartments each one is beautifully furnished and decorated in typical Tuscan with fine finishings and supplied with every comfort : Spacious kitchen, Cooker/Oven, Fridge, Freezer, Satellite TV, Double bedroom, bathroom with shower, central-heating and everything you’ll for the kitchen bedroom and bathroom. Each apartment is completely independent and has its own lovely terrace where you can enjoy breakfast or romantic candlelit dinners. Il Vecchio Mulino is one from the medieval town of Belforte and six from Radicondoli where you’ll find all you need: local shops with typical local produce, restaurants, pizzeria, TM chemist’s doctor’s and Post Office, inns, various shops, tobacconists, newsagent, bank & ATM. www.vecchiomulinofarmhouse.com >>Vecchio Mulino farmhouse is a height hundred renovate residence, immerse in the nature, between Vineyard and olive groves with a beautiful view on surrounding hills. >>The position is sunny and ventilated because it is on an hill, but just few km from artistic and historical Tuscan places. >>Surrounding the farmhouse there are a big equipped garden, poll, wi-fi, a little paradise, where it’s possible relaxing. >>The apartments, with stylish furnish, terracotta floors and wooden beams, were made with care to give a comfortable accommodation. Vecchio Mulino offer many ways to relax and have fun: Rental mountain bikes, swimming, massage, Tuscan cookery courses, photography workshops, riding lessons, trekking on horseback, river and lake canoeing, trekking and orienteering, potholing, archery, tennis, thermal spring cure and an adventure club for kids and adults all this available within easy distance. All taxes 10%,Electricity, Water,Heating,Gas, bed linen and bath towels,Pool,Garden, Final cleaning, Private Parking. Check-in: from 3 pm to 6 pm or later upon request. Vecchio Mulino offer many ways to relax and have fun:MOUNTAIN BIKE FREE, swimming, massage, Tuscan cookery courses, photography workshops, riding lessons, trekking on horseback, river and lake canoeing, trekking and orienteering, potholing, archery, tennis, thermal spring cure and an adventure club for kids and adults all this available within easy distance. Vecchio Mulino provide bed bathroom and kitchen linen changed weekly,private car box,gazebo furnished, barbecue set ,service laundry. We take care of all cleaning,pool and garden. maintenance and are on hand to assist you and provide information on tours or itineraries for excursions in the locality, advice on restaurants, inns, wines and wine tasting. On request we’ll offer daily cleaning , complete changes of linen, an extra single bed,cot or highchair. 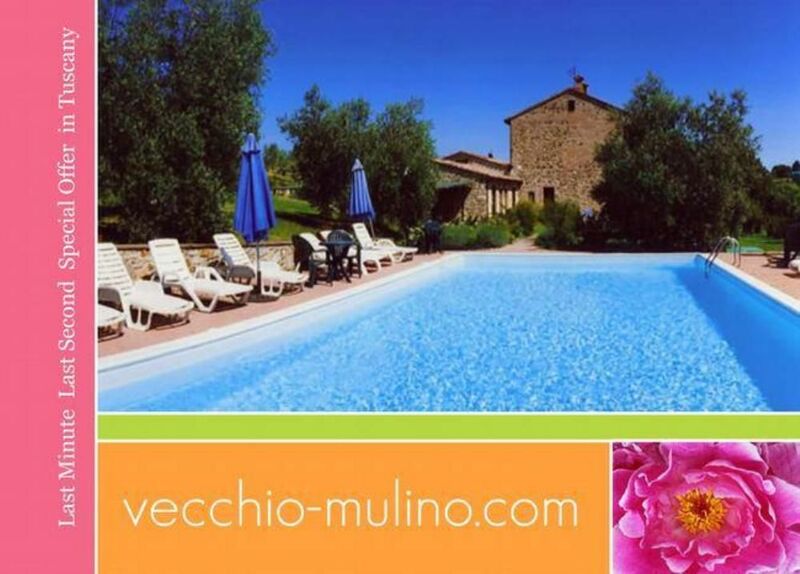 Vecchio Mulino is located among the sweet rolling hills of the senese countryside, near to Siena, San Gimignano, Florence, Volterra, Monteriggioni,Chianti,Pisa.